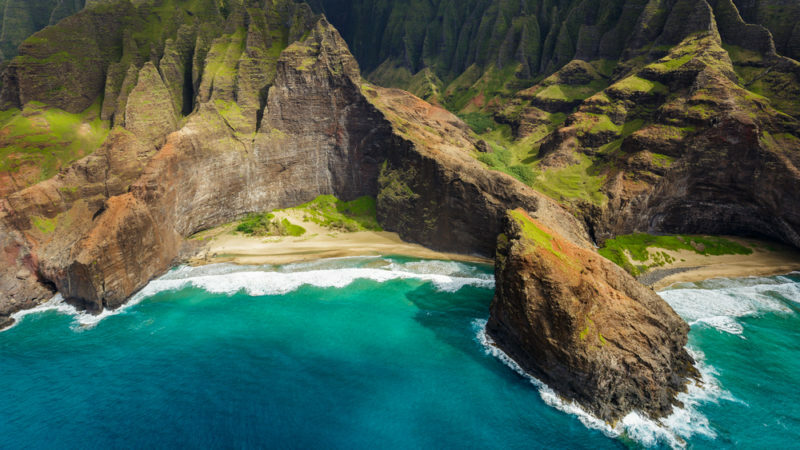 The best way to experience the Na Pali coast is by helicopter, boat or the Kalalau Trail. While the first two options can be pricey for some, the Kalalau trail is also often not an option because of how dangerous the trail is. Those who aren’t in shape or suffer from health problems will find the famous Kalalau trail to be out of their league. But viewing Na Pali is still possible on some of the easier Kauai hikes. These are a few of my favorites! Kauai is not nicknamed the Garden Isle for no reason. The gorgeous greenery, rainforests and wild landscape is thanks to all of the rain Kauai gets on a daily basis. For all of your Kauai hikes, keep in mind that rainy days mean slippery, muddy and more dangerous hikes. Take proper caution and make sure you have the correct shoes for the hike! Athletic shoes will usually serve you well, but a few of the trails require proper hiking boots in order to complete the hike safely. Just past the 17 mile marker in Waimea Canyon, you’ll find an area for parking that’s usually empty if you arrive early in the morning. Awaawapuhi is one of the more popular Kauai hikes because of you’ll see spectacular views of Na Pali without exerting too much energy. You won’t find steep inclines or big boulders testing your footwork here. The hike is a little over 3 miles and the best part is it’s pretty much a downhill walk from the parking lot. Unfortunately, that means going back up will be all uphill, but the view is really worth it. Be mindful of the roots you’ll come across and know that any rainfall will make your walk on the slippery side. 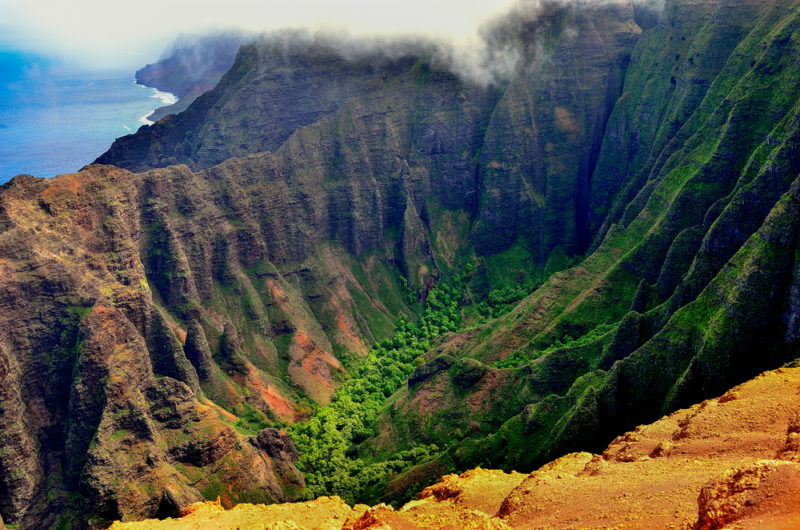 Most hikers will take 3-4 hours to complete this Kauai hike. Depending on how fast you move, it will take most people about 1.5 hours to reach the viewpoint. The dirt path through the trees, shrubs and tall grasses are clear and obvious so getting lost is not too much of a worry. As with many Kauai hikes, the dangerous part is going past the designated viewpoints and onto the mountain ridges. Be very careful if you do choose to venture down the ridge. While the view and potential selfie will be incredible, the path is narrow and once you fall, you’ll be sure to suffer injury or even death. It’s very difficult to get help on this side of the island and in most cases a helicopter will have to fly over to pull you up and out. If you want to know more about the Awaawapuhi trail, check out Postcards From Cait’s informative post about her experience. Alakai swamp boardwalk to Kilohana lookout. The Pihea trail is one of the most fun Kauai hikes out there! You’ll begin at Puu O Kila lookout and start off with an awesome view. From there, Pihea trail will surprise you with a variety of fun: curvy dirt mounds, Kauai’s signature rainforest, large boulder-like stairs, a boardwalk through the forest, creaky wooden stairways, a stream crossing and even a walk through a swamp! The mist and fog will come and go, leaving you with that beautiful, eerie feeling. The end goal is Kilohana lookout, which is commonly cloudy and usually you can only catch glimpses of Na Pali here and there. But if you’re very lucky (and early) you may just have an incredibly clear view before the fog sets in again. Compared to other Kauai hikes, Pihea really has it all. It’s fun, interesting, muddy, a workout, has cool views, eye-catching pathways (just look at that swamp!) and a bunch of fun. Kids really love this hike since the scenery keeps changing and it’s very different from most Kauai hikes. Make sure you have a really good pair of shoes for this hike. They don’t have to be heavy duty hiking shoes, although those are preferred. Just make sure your shoes are sturdy and allow you to walk, climb and jump safely since you’ll be walking on all kinds of terrain. Na Pali coast and Nualolo valley. 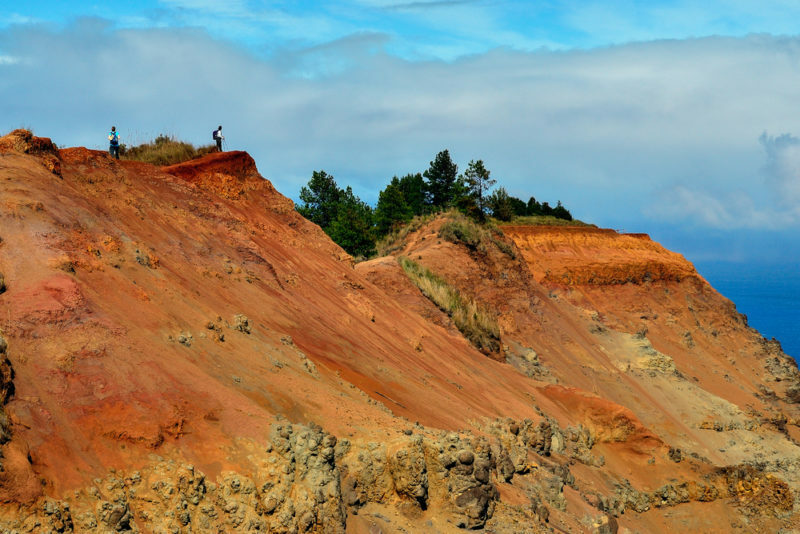 If you’re into more dangerous hikes – slippery mud, mountain ledges, etc., then this Kauai hike may be for you. 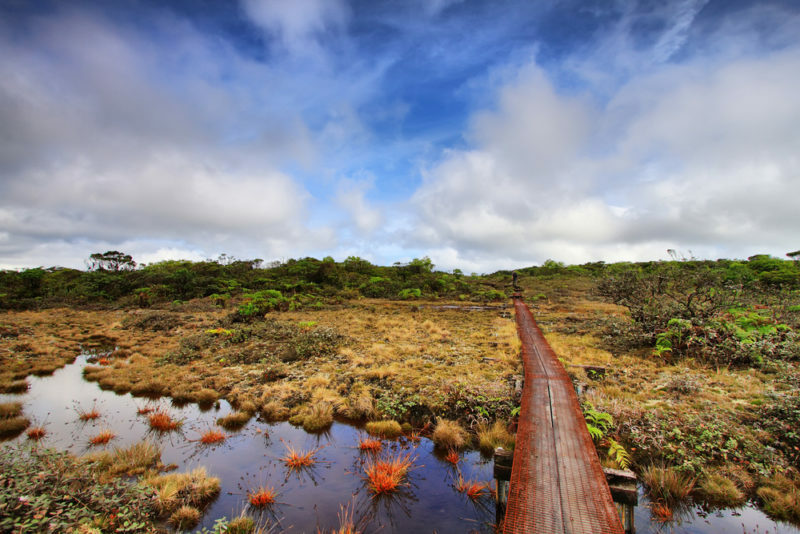 It is a pretty normal hike during sunny days, but after and during rainy days, Nualolo becomes a challenging hike that adventure seekers will want to try. This trail is difficult and dangerous in some areas and it’s really only for people who are experienced. I wouldn’t recommend children coming to Nualolo just because if they’re not paying attention, it could be disastrous. Even adults should always be on their toes. But, if you’re fit and able, then once you get to the coastline and to the end of the trail, you’ll be amazed by the spectacular view. Make sure it hasn’t been raining here recently before you attempt Nualolo (this holds true for any Kauai hikes). However, if you’re going for the ultimate challenge Nualolo can offer, then by all means, go for it! What’s neat about the Honopu ridge trail is that once you get to viewpoint, you’ll get to see Honopu beach. It’s one of the many beaches along Na Pali that are only accessible by boat. Much of the trail is hidden by ferns, so it’s highly recommended that you wear long pants to avoid being scratched. The trail itself is on the shorter side and is about 2 miles from the trailhead to the viewpoint. It’s a good one if you’re short on time, but still want that hint of exploration to your hike. The last I heard was that unlike other Kauai hikes, the Honopu trail wasn’t as well-maintained. Ask around or go with someone who’s familiar with this trail. Sailing, snorkeling and dolphin watching are popular Na Pali ocean activities that will amaze you on your Hawaii vacation. Viewing Na Pali by helicopter is also a wonderful experience. Kauai has plenty of unique waterfalls which you can only reach by helicopter. Check out Kimmie’s Kauai experience at Adventures & Sunsets for more ideas on your Kauai vacation. Traveling to Hawaii and have questions? Join the Expert Hawaii Travelers Facebook Group! Amy Fujimoto is a 4th generation local Hawaii resident and an avid world traveler. When she's not rediscovering her island state, she enjoys reading books and watching Korean dramas with her Dad. You can follow her on Twitter @alohawithloveHI. Get fabulous tips, access to contests and prizes, local guides, tour reviews, food recommendations, highlights on Hawaii products, meet local artists and be introduced to an entirely different side of Hawaii. Welcome to the islands! Mahalo! Check your email to confirm! Locals love canned spam, not e-spam. Unsubscribe anytime.